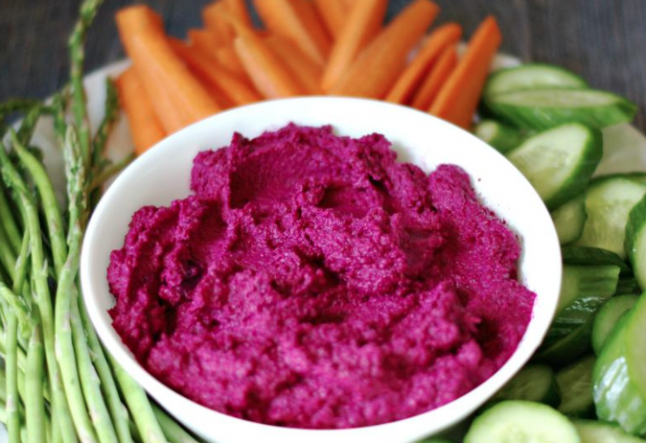 Hummus is one of the easiest, guilt-free and healthy dips out there? Here is a new take on hummus to add to your recipe book. All you need to do is put all the ingredient in a food processor or mixing bowl and process them until you reach a smooth consistency. The main ingredient, chickpeas (or garbanzo beans), high in fiber and with a low glycaemic index are great for preventing constipation and other digestive problems, as well as a good option for weight loss diets. Beetroot is low in calories (1 cup contains 58 kcal), lowers blood pressure, is high in nitrate which is linked to slowing the progression of dementia in older adults, contains and antioxidant known as alpha-lipoic acid, has a high fiber content, and contains choline which helps with sleep, muscle movement, learning and memory! Beet that!